What happens when you transform a lemon meringue pie into grain-free, delectable, single-serving desserts? You get lemon meringue cupids. Meringue cookies are topped with lemon custard and fresh whipped cream in this tantalizing recipe from guest blogger Walter Jeffries of Sugar Mountain Farm. Thanks, Walter! I love my mother’s lemon meringue pie. The problem is it must be all eaten immediately in one sitting or the crust gets soggy from the filling and our family just can’t seem to eat that much pie that fast. Our solution was to develop a new recipe that uses the same basis but is made in individual servings rather than whole pies at a time. Thus the evolution of Cupids. Beat egg whites and cream of tarter until they begin to stiffen. Slowly add the sugar. When the egg whites peak, use a large spoon to dollop out cookies onto the parchment paper covered cookie sheets. Use the back of the spoon to create a slight depression in the middle of each cookie. If the cookies are too thin, they will break easily when you try to take them off of the sheet. Bake at 250 for 1 1/2 hours. The meringue cookies will store for many weeks in a glass container with a tight lid. I put a drying packet in with the cookies to help keep them crisp. Beat 1 pint of whipping cream. Add sugar and vanilla to taste. Mix 1/2 of the whipping cream and the chilled egg yolk mixture together. This completes the lemon filling which will keep well in the refrigerator for several days. 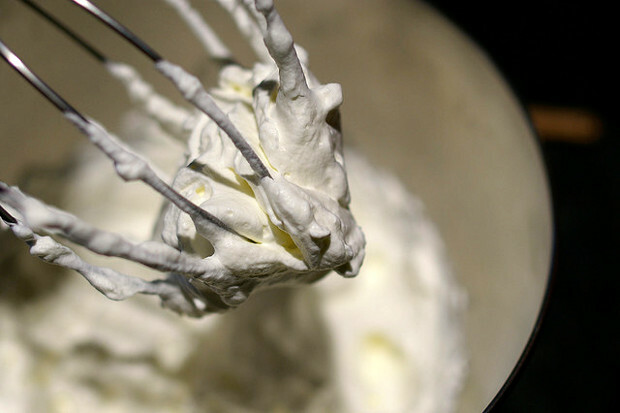 Reserve the remaining whipping cream to top your cupid creations. 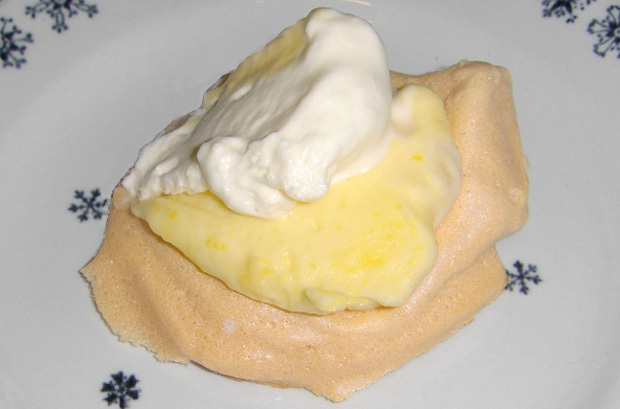 Using the Meringue Cookies as a base, add a scoop of Lemon Custard on top. Next, top with a dollop of the remaining whipped cream. These are best if eaten immediately after assembling and don’t store well when assembled. Because they are individual servings they’re ideal for pot-lucks. 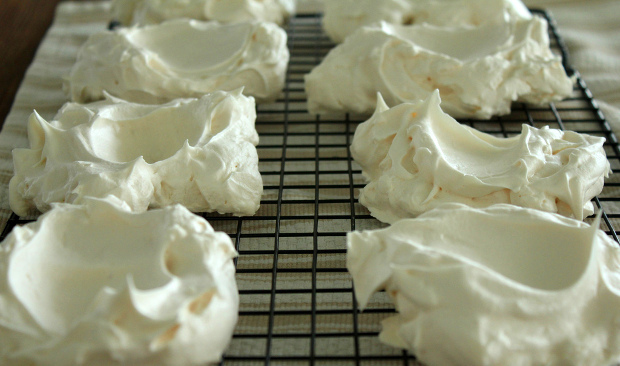 We make the meringues, custard and whipped cream up ahead of time and keep the ingredients separate. This keeps the meringues crisp and delectable. Then on the buffet we simply put out the components and people make their own, thus getting the freshest possible pie. Any left over, which there is at home but never at a pot-luck, is still good and can be savored another day. Those sound amazing! 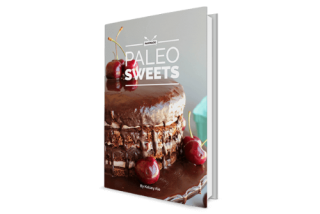 Would it work to use Stevia in place of the coconut sugar? That looks so yummy! Thanks! 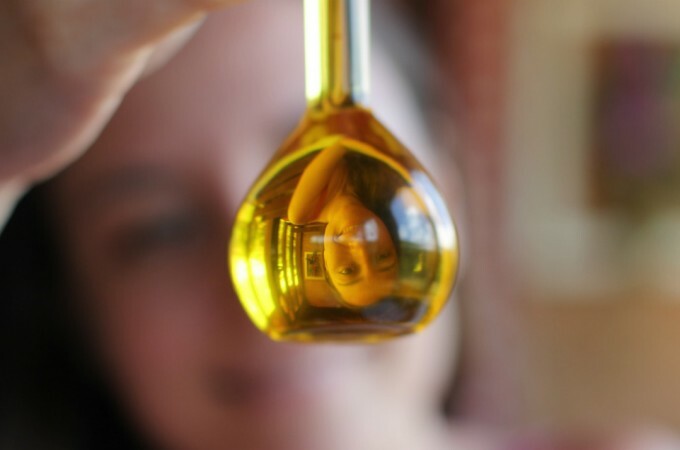 Can this be made (successfully) with honey? That’s the only sweetener my daughter can handle. Guess I could stevia drops, too? I have made the meringues with honey. They brown a bit more easily, so look a bit different. But they still taste nice. I have not used honey in the custard, though. I would experiment with 1/4 cup honey in the custard (in place of the 1/2 cup coconut sugar) and see how it turns out. Interesting. I like honey and I like the meringues well browned. I will have to try that next time. Part of what we like about this recipe is it uses both the egg whites and the egg yokes up. Yes! It’s always a plus to not have extras of either of those hanging around. @Brittnee — You could experiment. I would use a liquid stevia extract, not the powdered stevia. I don’t think it would affect the meringues much, but it may affect the consistency of the custard. Please try it and let us know! Those are beautiful AND delicious looking! Wow, these sound great! When meyer lemon season comes around in January, I bet that would add a lovely flavor to the lemon. Will keep this around for sure. Oh, MY. I’m dairy-free – do you think I could substitute the heavy cream in the custard with coconut milk? Absolutely! Then it’d be a coconut-lemon cupid. Sounds delightful! Looks yummy! When I do these I will use Lemon Curd. 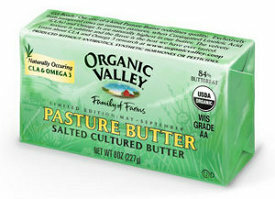 Curds are semi-firm spreadable fruit preserves made with egg yolks, sugar, butter and fruit. Suitable for canning. Can even use tomatoes…Yes Virginia, tomatoes ARE a fruit even though Congress legislated them into vegetables. It’s fall now and my California neighbors have Oranges, Lemons, Limes, Kumquats going like mad, and they LOVE me for taking all that “messy stuff” off their hands [imagine!]. See ‘ya down the road apiece. My kids love meringue, this sounds delicious, will try this one, and yes with honey too. I like meringue goods and have tried the lemon meringue pie recipe. yes, I’m also wondering the same thing! I want to make these for a group of 20 ppl… is that realistic? I tried baking these today and the colors of my cupids do not match the photos on your web page. My cookies and custard are closer to light brown colors due to the color of the coconut sugar. Did you use another kind of coconut sugar that is white or what did I do wrong? Has anyone else had this issue?